It is amazing to me how common "wraps" have become in our diet. I think there is a good reason. They're generally easy to make and easy to eat. With the right ingredients they can also be nice and filling. I found this Chicken Sate Wrap (cal 321)in my Mix & Match Low-calorie Cookbook but I then found it on line.The flavors are rich and satisfying with a combination of light coconut milk, soy sauce and peanut butter. 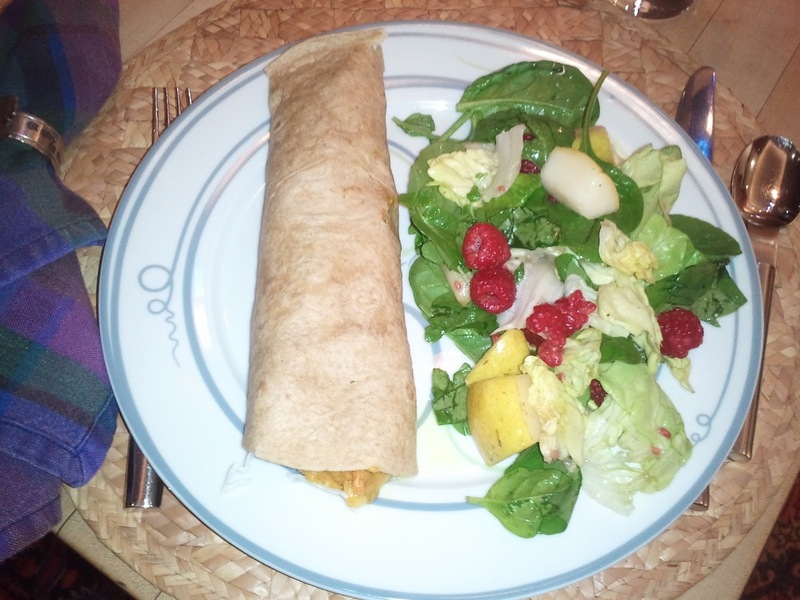 I paired the Chicken Sate Wrap with a Mixed Greens with Pears and Raspberries salad (cal 86), which I have written about in a previous blog, for a total calorie count of 407. A great menu filled with flavors and colors. A big hit with the family and a definite repeat. Overcoming the Exercise Aversion in the New Year!